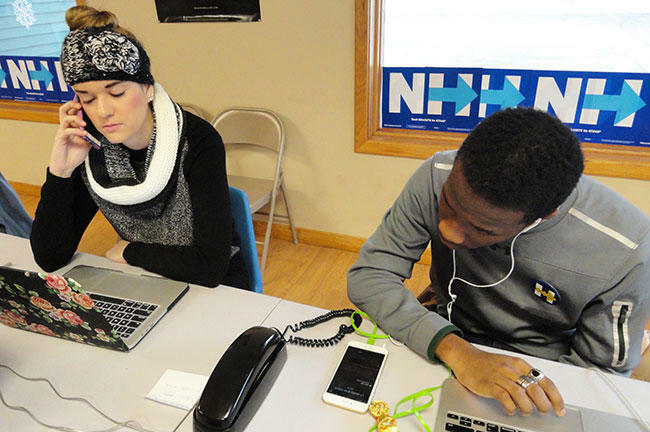 USF St. Petersburg students Kristina Sonstroem and Victor Sims work a phone bank in Salem, NH, for Hillary Clinton. 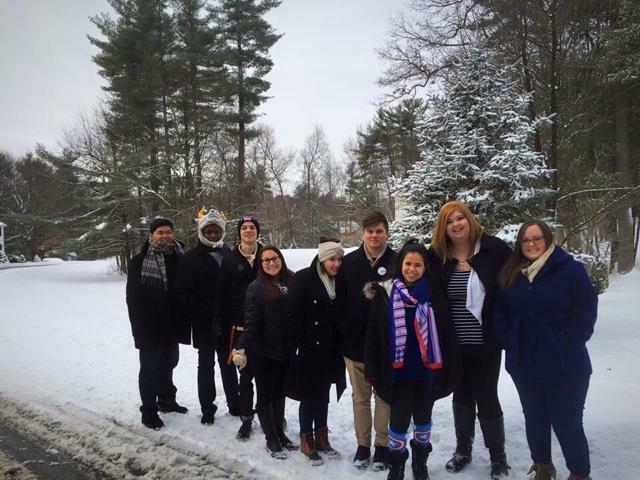 "Road to the White House" students experience snow. Victor Sims: "We were excited because...we don’t see snow, so we’re just ‘Yeah, we’ll go canvassing!’ and then, thirty minutes, we’re like ‘Oh god, why did we go canvassing?'" 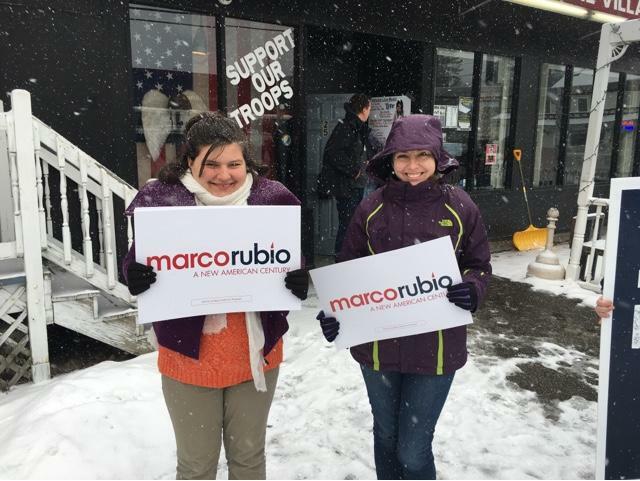 Miranda Latimer and Georgia Pevy campaign for Marco Rubio. Pevy: "I am proud of the work we've done here in the Granite State and we can hold our heads up high." 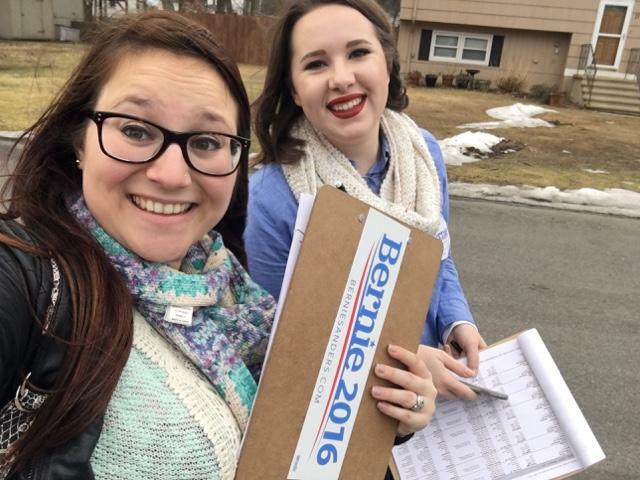 Alyssa Winston and Samantha Kendall go door to door for Bernie Sanders. Kendall: "Just the opportunities that we’ve had and the people that we’ve met, it’s really just been incredible." 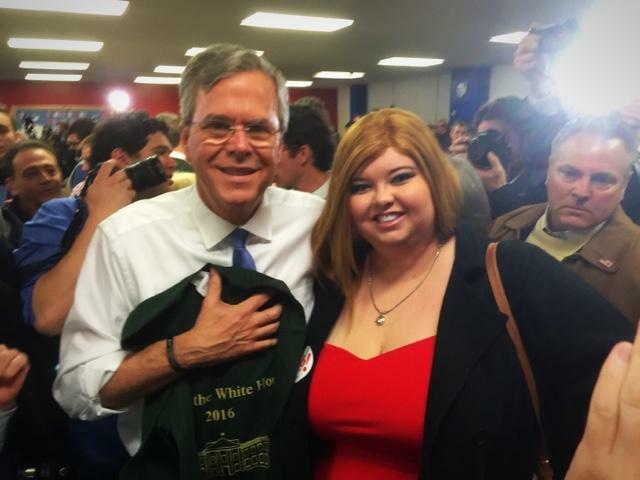 Emily Hughes presents her candidate, Jeb Bush, with a class t-shirt. 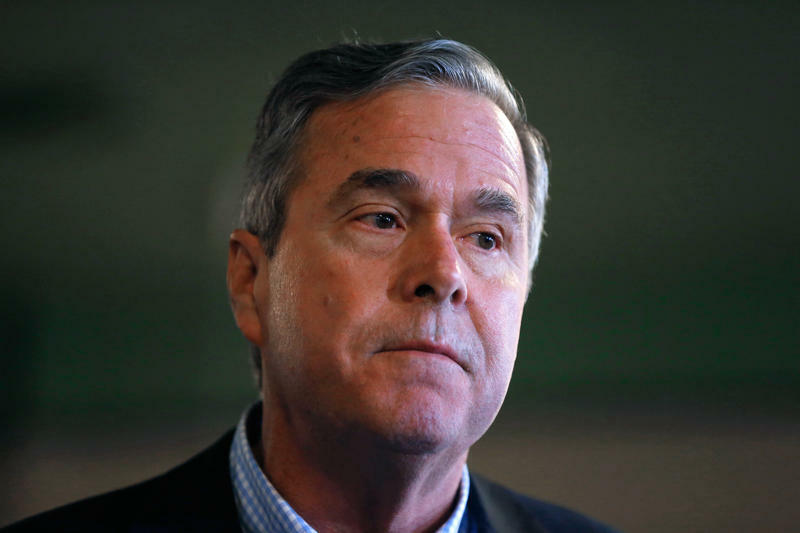 Hughes: "I get a good vibe from Jeb and the more I talk to him, the more I feel comfortable in my vote for him." 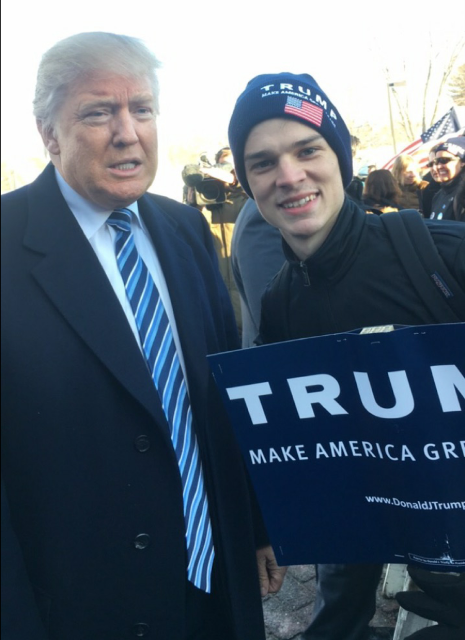 Terran Winegeart meets his candidate, Donald Trump. Winegeart: "I must say, my face was frozen into a certain stupid face. But I'm willing to take some grief considering the fact that most people will never have their arm around Donald Trump." 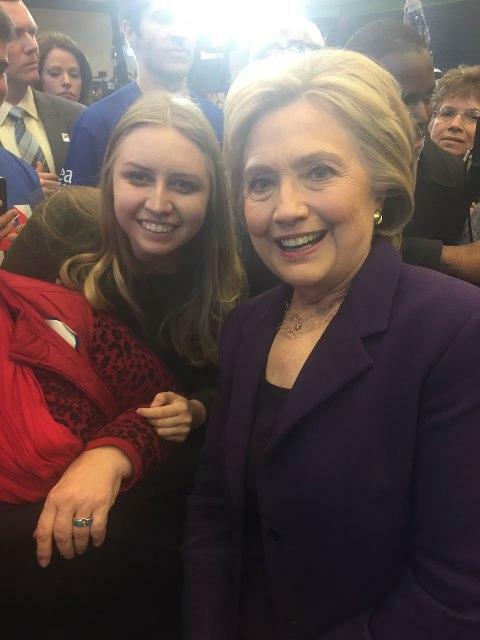 Randi Doan poses with her candidate, Hillary Clinton. Doan: "No matter what the outcome is I think the Hillary campaign ran a strong organization and will continue to get stronger as the results of other primaries come in." David Thompson changed from Martin O'Malley to Marco Rubio just days into the trip when O'Malley dropped out of the race. Thompson: "I knew that being part of Rubio's campaign would be a once in a lifetime experience." Students met other candidates, even if they didn't campaign for them. 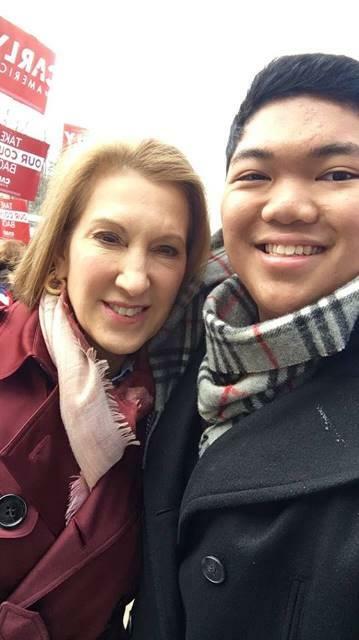 Here, Ted Cruz backer Nicholas Encinas poses with Carly Fiorina. 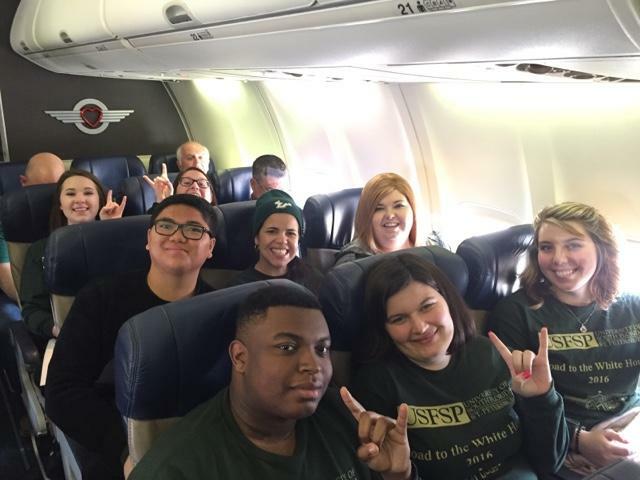 Encinas: "It’s been an amazing experience. I’m definitely going to be thinking about this trip for a long time." 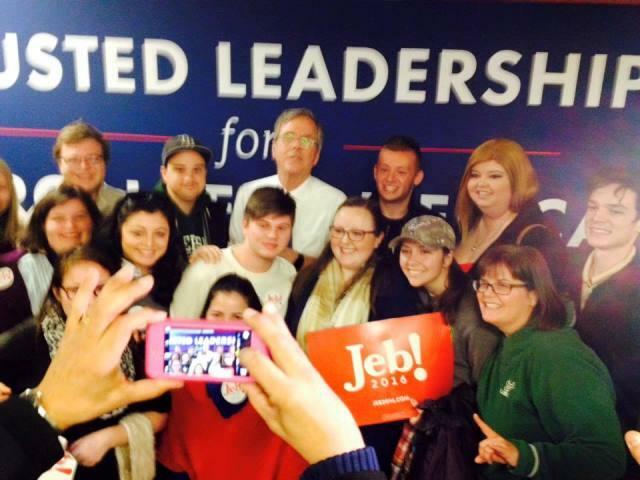 Members of the class (Dr. Judithanne McLauchlan at bottom right) pose with Jeb Bush. The class meets Marco Rubio. 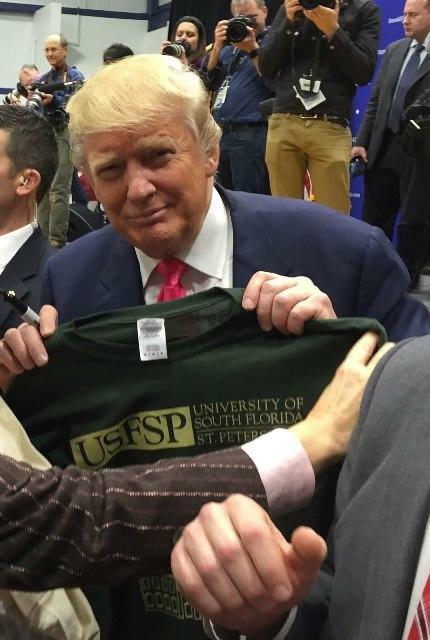 Donald Trump poses with the class t-shirt. 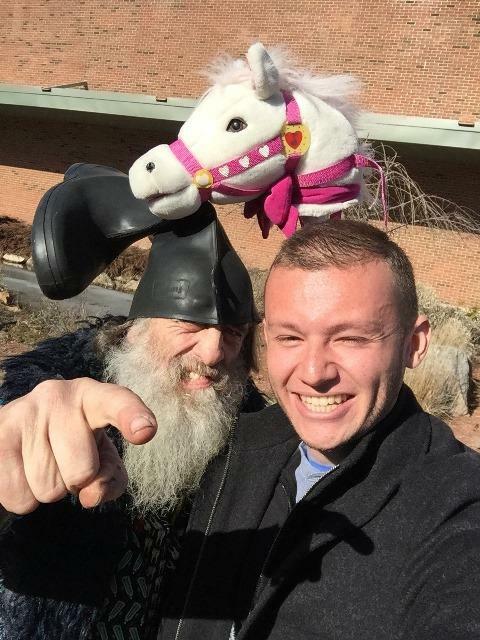 Candidate/political satirist Vermin Supreme (left) was pretty popular with the students, including Rubio backer Christopher Happel. The performance artist's platform includes the promise of a free pony for every American. 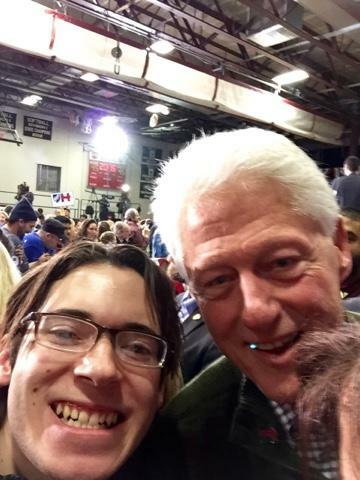 Hillary Clinton supporter Antonio Permuy meets former President Bill Clinton. Permuy: " I never would have thought that I'd leave (New Hampshire) having shaken both Clinton's hands twice." Students campaigning for Hillary Clinton convinced former Vermont Gov. 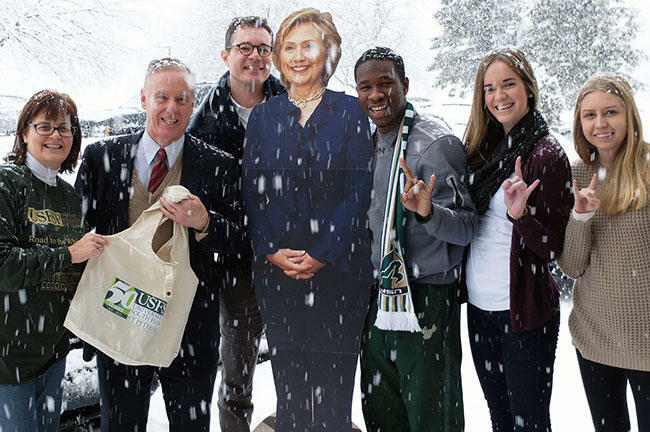 Howard Dean to join them and a Hillary cardboard likeness for a picture in the snow. 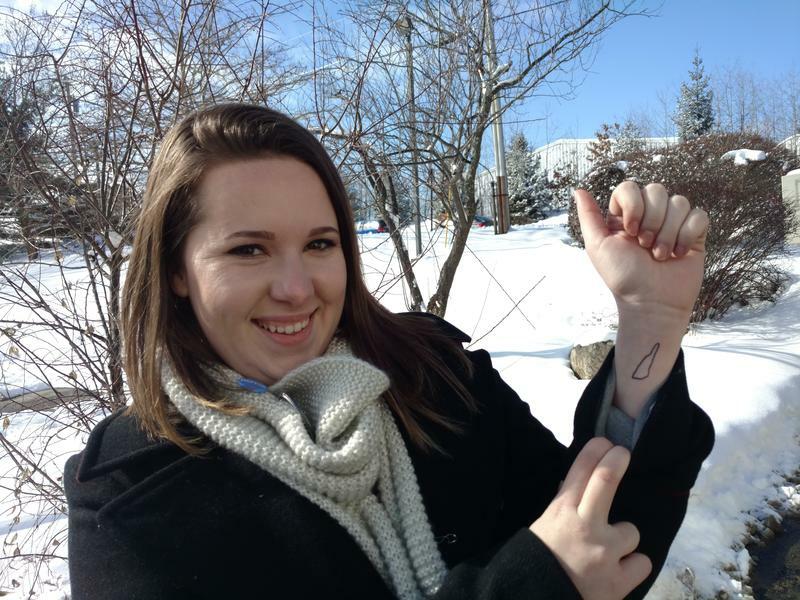 Samantha Kendall shows off the tattoo she got of the state of New Hampshire. Kendall: "I want to move to New Hampshire one day." 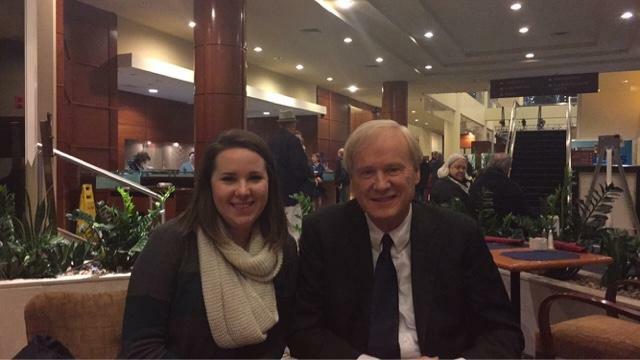 One of the highlights of Samantha Kendall's week was talking with MSNBC host Chris Matthews for 20 minutes. Kendall: "After Chris left, the three of us (students) looked at each other in disbelief...had that really happened?!" The students were interviewed by media from all over the world. Sanders backer Emily Thatcher spoke to CNN. 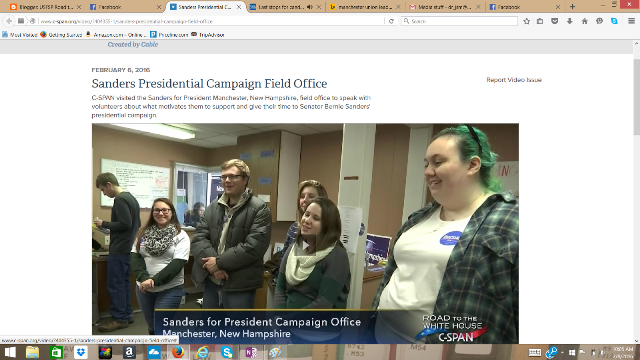 CSPAN also spoke to the students volunteering for Sanders. 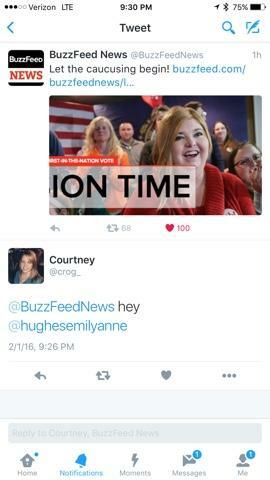 Emily Hughes appeared on Buzzfeed's Twitter feed. 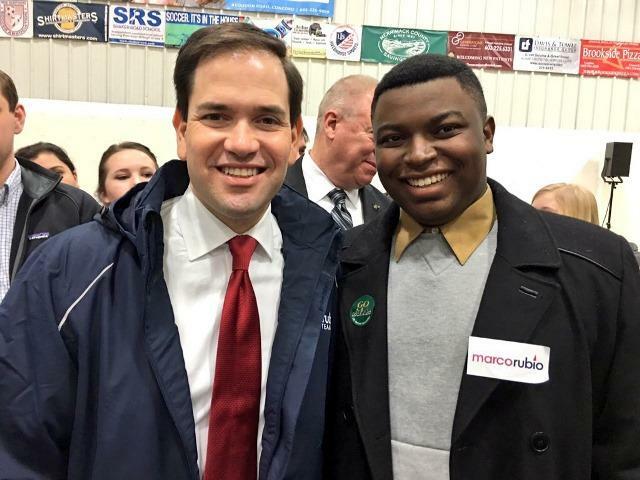 A Miami TV station spoke to the students at a Marco Rubio rally. 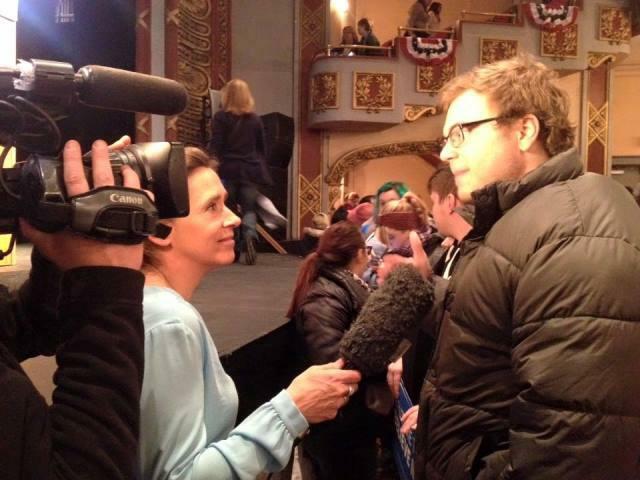 A French journalist interviews Patrick Bateman at a Sanders rally. 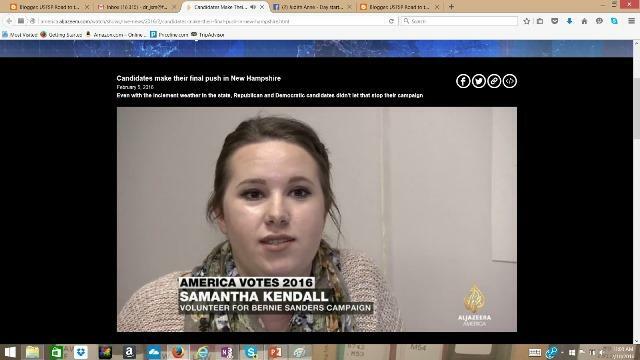 Samantha Kendall was interviewed by Al Jazeera. 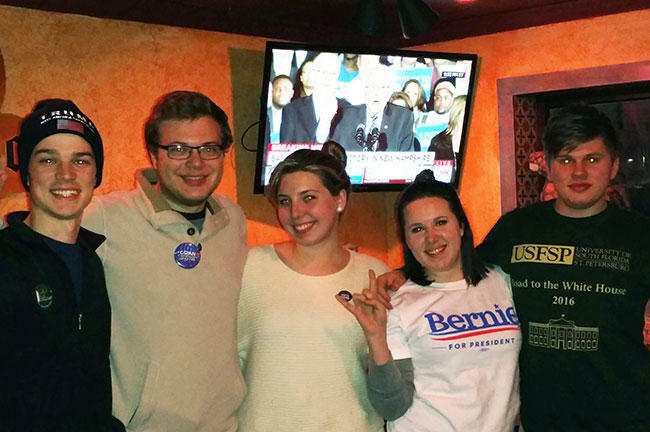 The students who backed Trump and Sanders pose for a victory photo at the class' Election Night watch party. Some of the class on the flight from Tampa to New Hampshire, much more bright-eyed than they were on the flight home. 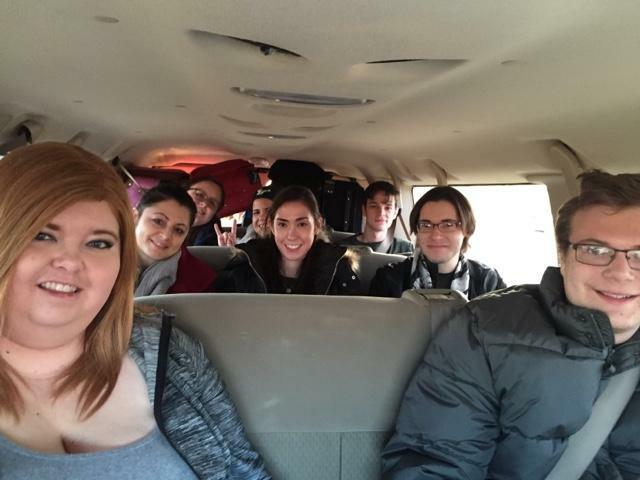 23 students plus luggage meant three vans had to take the class from the airport to their hotel. 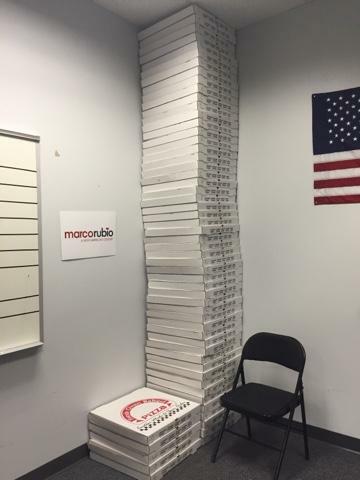 A stack of empty pizza boxes - the staple of a campaign - at Rubio headquarters. Unnamed student: "If I never see another slice of pizza again, I'd be happy." 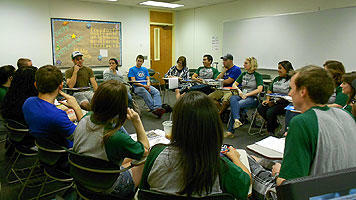 WUSF's Mark Schreiner joins students in the USF St. Petersburg "Road to the White House" class in New Hampshire. 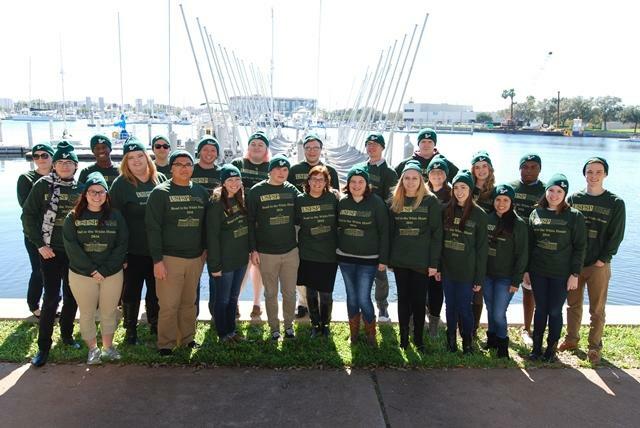 Almost two dozen students in a USF St. Petersburg political science class traveled to New Hampshire to work on presidential campaigns in advance of the first in the nation primary elections. WUSF’s Mark Schreiner joined them in the Granite State, following the group through the last two hectic days of campaigning. 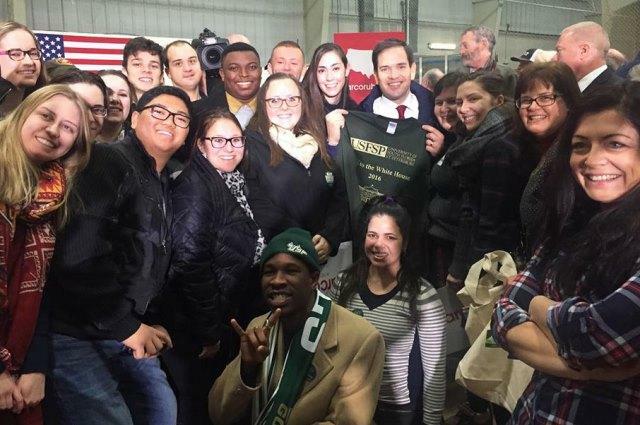 College students in the Road To The White House course at the University of South Florida St. Petersburg have just returned from working on the New Hampshire primary. This week on Florida Matters (Tuesday, Feb. 16 at 6:30 p.m. and Sunday, Feb. 21 at 7:30 a.m.), they join us to talk about what it's like to be up close to the candidates and their campaigns. University Beat: USF St. Pete Students Walk the "Road to the White House"
This week's University Beat on WUSF Public Media introduces you to Professor Judithanne Scourfield McLauchlan and some of her students, and tells you about some of the experiences, from meeting the candidates to debating reality TV stars. 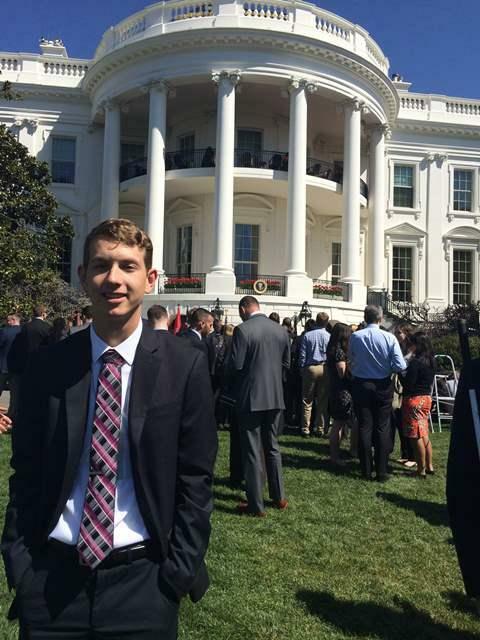 University Beat report on Tyler Lewis' internship at the White House. College internships can be a toss of the dice as to what a job entails. Sometimes it’s something cool, like a medical student assisting on a surgery; sometimes it’s a drudgery, like a business student photocopying documents all day. Tyler Lewis’ internship was definitely in the first category – as he worked earlier this year at the White House. "You kind of have to pinch yourself every day you’re there and remember where you’re at," Lewis said. Democratic candidate Judithanne McLauchlan, who was inspired to run for Florida Senate District 22 against incumbent Republican Jeff Brandes because he was the only vote in the Senate against an alternative to Medicaid expansion, lost 57 percent to 43 percent. A University of South Florida St. Petersburg political science class is taking off Saturday for the Granite State, where students will be taking part in presidential campaigns ahead of New Hampshire's first in the nation primary election. 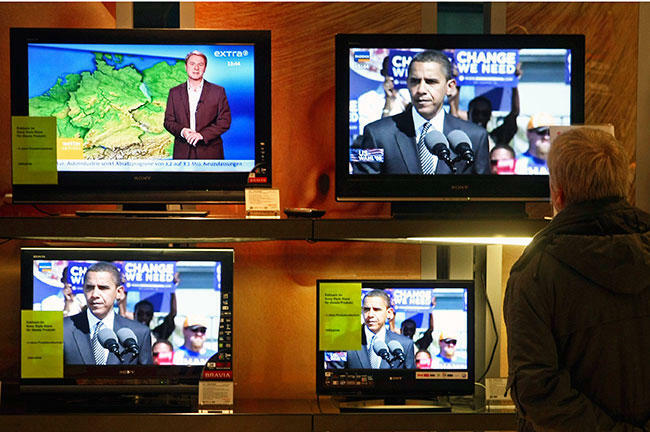 WUSF's Mark Schreiner talks with USF Muma College of Business Professor Balaji Padmanabhan about his research into the correlation between TV viewing habits and presidential voting choice. "The days of surprise about actual election outcomes in the big data world are likely to be fewer in the years ahead, at least to those who may have access to such data." Those are the opening words of an article written by a University of South Florida Muma College of Business professor and his research assistant, who broke down nearly a half billion minutes of TV viewing in 2012 to determine that what people watch could show who they'll vote for president. A raucous sell-out crowd greeted Donald Trump Friday night at the Sun Dome at the University of South Florida in Tampa. An estimated 10,000 people filled the arena to capacity, while several thousand others were turned away at the gate.